Over the last few videos we have dealt with making decorations for Christmas and this Spellbinders Square Ornament is another one that you can use for that or any other ocassion. This is one that uses any of the square dies that you may have in your collection. Those in the picture have been made into decorations to welcome a New Baby. 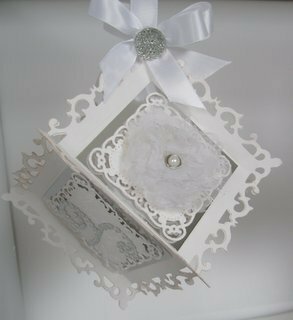 I have used the Spellbinders Decorative Labels 1 and the largest die in the set ... it gives a good sized ornament and the edging is a very pretty effect. I am trying to make you look in a different way at any of the dies that you have and sometimes the choices are not always apparent at first. But if you cut all the dies out in some cheaper paper everytime you buy a set then you will be able to play around with all the shapes and see what you can produce. Layer them, cut them, weave them, add in other pieces from other sets you may have and make them work for you. 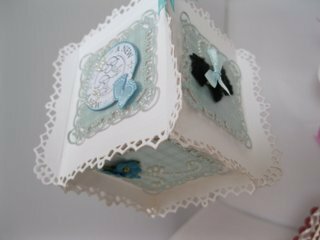 This is one that has been created as a Wedding Decoration and I have added some white Organza Flowers to two of the panels. It adds a touch of luxury to the shape and you can cut the Bling up to siut any of your needs. You can make yours for any ocassion that you like but they would make very pretty Christmas Ornaments to decorate your home for the festive season. Don't be afraid to experiment ... after all you bought these dies and they cost you good money so you will want to get as much out of them as you possibly can. They are such a good way to enhance all your cardmaking and it is almost impossible to make a bad card with them. But it is only card ... so if you make a mistake then don't lose heart ... just try, try, try again. You will get there in the end and the cards you make will those you can be really proud of .... and that's a promise.